Prominent throughout Medieval Ireland, the Irish long sword was utilized in many battles and wars. This inspired replica features a massive 33" stainless steel blade with a leather-wrapped hilt and ornamental pommel. 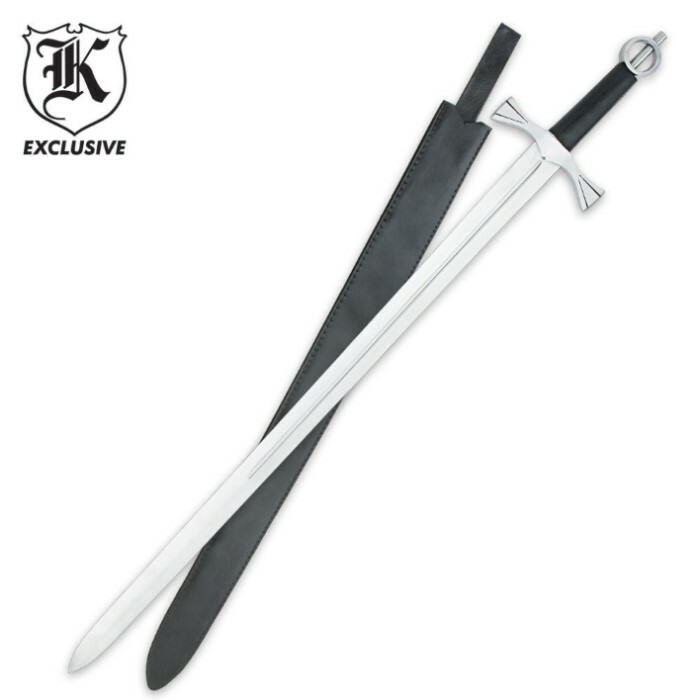 The attention to detail adds tons of authenticity to this replica sword. A leather blade scabbard is included. Measures 40-1/4" overall. If you only want to hang it up, buy it. If you plan to do anything more rugged than that keep looking, personally I think you should look at the Knights Templar sword. No wonder the Irish lost to the British if they were using these pieces of junk. This sword is not the usual quality that BUDK offers. Let us start out with the tip and work our way down it was not sharp or even. The balde was Paper thin and wiggled which accounts for the light weight I'm surprised I couldn't see through the blood groove. The bottom of the blade was too thick for the guard so they cut a big nick in ONE SIDE of it so it was set in wrong. The Guard and pommel were the only good parts the handle felt like it was made of cardboard. It didn't even fit in its own cheap sheath. I expected a lot more for 60 bucks probably I had a bad one. I had not it an hour when I decided to return it. surprisingly light considering its size. this item quality-wise is exactly what you expect for its price tag. worth every penny and not a single cent more. a fair display piece, functional, and definitely capable of taking some abuse. sort of a take it or leave it item. you either love or you don't. but a worthy item for any sword enthusiast's collection nonetheless.